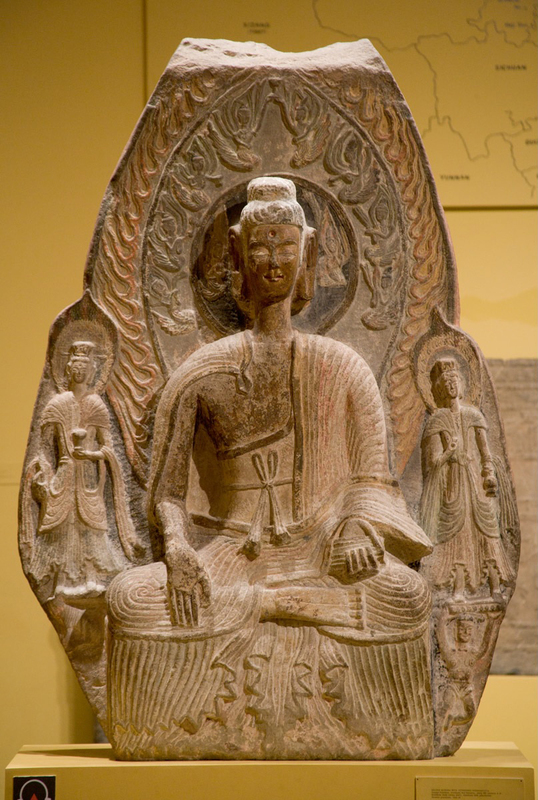 Seated Bhuddha with Attending Bodhisattvas, early 6th century A.D.
On the front of this stele Shakyamuni, the historical Buddha, is flanked by bodhisattvas, deities who have put off their own enlightenment in order to help mankind attain salvation. The back, which lacks a systematic symbolic or narrative program, is dominated by a large standing "universal" Buddha, also attended by bodhisattvas, raising his hand in the gesture of reassurance. Three seated Buddhas in the halo symbolize the deity's eternal nature, a concept that gained importance in China in the fifth century A.D. Scenes of the life of the historical Buddha and related legends cover the remaining surface. The imagery is standard for Mahayana, the dominant sect of East Asian Buddhism, which preaches a doctrine of universal salvation through numerous bodhisattvas. The didactic content of this sculpture would have reached the faithful who saw it in its original temple context. The linear carving is distinctly Chinese in contrast to the volumetric forms of the Indian sculpture from which the imagery derives. Long, narrow heads, attenuated bodies, and linear surface rhythms reveal a stylistic relationship with the metropolitan style of the Northern Wei period. A strong provincial character is expressed, however, in the parallel lines of the flattened drapery folds and the awkward body proportions. The red and blue paint remaining over large areas of the front of this sculpture demonstrates that color was an essential part of its visual impact.